A reminder in the hotel lobby that Barbados will celebrate fifty years of independence at the end of this month. Hotel artwork of a sugar cane harvester - a traditional crop on the island from which rum is made. A shower drives sunbathers to run for cover! A colorful house across the street from our hotel. THE BIRDS! THE BIRDS! THE BIRDS! The open air restaurant is typically filled with birds flying through, roosting on the backs of chairs and eating on the left-overs. You can barely see it, but there is a bird drinking from the cream pitcher. This colorful pigeon is walking right toward me. No fear! This bird is scoping out the room for possible left-overs. Other than the birds, breakfast this morning was all that it was cracked up to be! To "lime" is to sit around and "chill," "chew the fat," "goof off" or "just pass the time." It is a tradition in this presbyterate to "lime" on the last night of the retreat, so we "limed" before going to bed. We sat around the room and told jokes and old stories, while having a few drinks. The bishop and most of his priests in the whole diocese are seated here. All, but one priest who signed up was able to make it - out with the flu? This is a shot of the first conference. Our first dinner was an "international buffet" in an open air restaurant at the hotel on the shore. Thanks to the generosity of the Catholic owner of this hotel, the bishop and his priests have a nice place for their annual retreat. They hope someday soon to have their own retreat house which, even though simpler, will be more quiet, private and conducive to prayer. Right now, I am in my room ready for bed with earplugs, trying to drown out the band across the courtyard. Adoration of the Blessed Sacrament was part of the retreat every day. Doing my thing in Bridgetown, Barbados. Bishop Gordon on the left. I got here yesterday on the flight from Louisville to Miami to Bridgetown, Barbados, without a hitch. I went through TSA PRECHECK in Louisville, the flight left on time and arrived in Miami just a few minutes late. Even though the connection time was minimal, my Barbados flight was just a couple of gates down from the gate where I landed. With only a few minutes to spare, we boarded and left for Barbados. What I thought was going to be a major glitch, turned out to be a blessing. The airline did not have custom forms for Barbados on the plane as normal, so after we landed we waited for someone to bring them out to the plane. We stayed on the plane and filled them out. Once inside, I was first in line going through the first station because I had put all the answers on a little card and had it in the back of my passport so I wouldn't have to fumble looking for the answers. I was way ahead of most other people who were looking for that information on tickets and passports. When I went to the second station where they can check your luggage and ask you a bunch more questions, there was a man standing collecting the form without questions and waving everyone through. It turned out to be the easiest entry I ever made into a Caribbean country. A permanent deacon candidate/taxi driver was right there to meet me and take me to the bishop's house. Since he was not able to be there when I arrived, the bishop had already texted me the code to his house entry keypad, so I went right in. I already knew where my room was, since I have stayed there a dozen times. AFTER THE OTTAWA TRIP, I NEEDED A BREAK! At the bishop's house, I got Lisa, the housekeeper, to show off her very intricate hairdo! It is a piece of art, for sure! She got married since the last time I saw her, a year ago, and had a baby. We always have such interesting conversations. 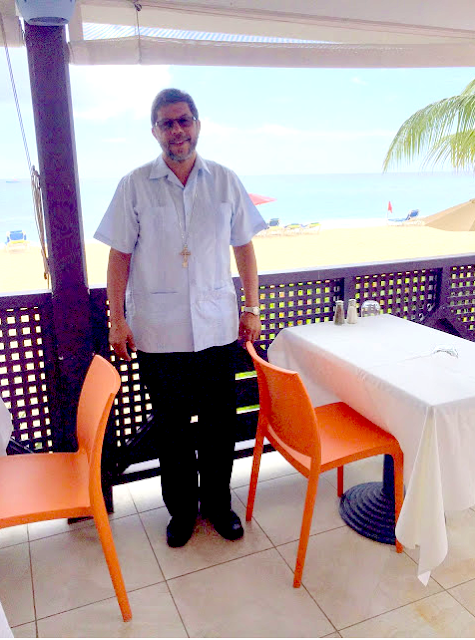 THE "BISHOP SHEEN" OF THE CARIBBEAN? HARDLY! I spent the morning in the Cathedral rectory in a makeshift "studio" recording short videos for the CATHOLIC COMMUNICATION office - something I am not used to doing. We ended up doing six in all. The last two were totally spontaneous - without any notes. I hope they are OK because they are not something I can undo. One of the things my organization, Catholic Second Wind Guild, did was to donate $11,000 worth of recording equipment and set furniture for doing evangelization on Catholic television throughout the Caribbean from their new studio next to the Cathedral. Doing the short videos reflects my hope for the Catholic Second Wind Guild - not just for retirees to donate money, but to offer their talents and skills to build up the church of the Caribbean. Below, in appreciation, Bishop Gordon insisted on taking photos of me in the almost finished studio, The gray wall has a control booth in the back and the green wall will allow for the projection of about any backdrop scenes for the programs he hopes to produce and stream live or for recording and televising later. Looking very much like a Catholic Bishop. Walking the Camino de Santiago, Spain, last summer. We had lunch on the beach in Bridgetown during a former visit. A diocesan "Year of Mercy" event in one of the parishes. Lunch at the Cathedral Rectory on a recent visit with Bishop Gordon, Father Tom Clark of Bardstown, Kentucky, and four of the local priests. Recent second dinner in Louisville in honor of Bishop Jason Gordon at the end of the table. Thanks to a generous Catholic hotel owner, we are holding the retreat at the hotel on the left of the sea wall. So far, I haven't had time to walk on the beach. The schedule is pretty tight. Maybe before the week is out? In any regard, it is nice to look at! While St. Vincent is basically a dormant volcano, Barbados is flat. While St. Vincent has few beaches and little foreign investment, Barbados is a typical island paradise with beautiful beaches and nice hotels. The Church, however, is small and certainly not rich. While the Church in Barbados has different needs, the Church's needs in St. Vincent are much greater. With your help, I will continue to do what I can to help both. It occurred to me the other day that I seem to write a lot about aging. Actually I am quite happy being 72 and headed toward 73. That is not what bothers me. I don't dwell on it. What bothers me is that everyone and everything seems hell-bent on reminding me! Here are some of my more recent observations. 1. When people start calling you by your first name at the Kroger Pharmacy and you find yourself embarrassed that they may be thinking, "Here he is back again!" 2. When people bump into you, they insist on calling you "sir," as in "Excuse me, sir!" 3. When you are filling in a blank spot on a computer site asking for your birthday, you have to scan down so far that you almost run out of numbers. 4. When you are talking to seminarians about something that happened at the Cathedral parish in 1987, they will stop you and say, "Father, I wasn't even born yet!" 5. You can wake up at 2:00 in the morning, work an hour on your computer, and go right back to sleep. 6. You are tempted to lie on that form at the doctor's office when they ask you to list your prescriptions and just tell them about the most serious ones. 7. You are walking across some floor, maybe the airport or the grocery store, and you are shocked by the sound of the shuffling of your own feet as you look around for an old person following you. 8. You find yourself taking the long way around rather than drive your cart down any isle of the grocery store that features items like DEPENDS, MIRALAX and FIXODENT as if they contain dangerous microbes. 9. You find yourself going to the bathroom "just in case," even when you don't have to go. 10. You keep thinking something that happened 10 years ago just happened three years ago - and you find yourself arguing about it. IF YOU DON'T LAUGH, YOU CRY? I DO BOTH - MORE AND MORE AT THE SAME TIME! As a regular volunteer down in the island country of St. Vincent and the Grenadines, I have been in this airport many times. Almost every time it has been a stressful event - delayed or cancelled flights usually or maybe left-behind luggage. I wasn't there, thank God, but this is what it looked like in the departure lounge during a flash flood last week. Can you imagine this water running through the terminal at Standiford Field in Louisville, Kentucky?